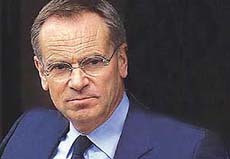 JEFFREY Archer was elected an MP in 1969, when he was not quite 30. At the time he had not written a single book, and by all accounts he was not even much of a reader of books. He worked hard, often as much as 18 hours a day, but had to resort to peculiar and somewhat unorthodox ways of making money — such as preparing the expense account claim of his business associates, on a commission basis. He is said to have inflated his own expense accounts by putting in items which had been paid for by others. But he continued to make influential friends and to cultivate them, and they helped him along in his business ventures. He set up an art gallery, which was opened by a heavyweight Tory and ex-Prime Minister, Edward Heath. The art gallery lost money and he sold it in a year. After that he set up his Arrow Enterprises, which was a fund-raising activity for charitable causes and here again some of the most respected personalities came to his aid. They included Lord Mountbatten, Noel Coward, Jackie Kennedy, Marlene Dietriech, and Princess Alexandra. These were good years. In commissions, or as some called it, an annual retainer of £ 45,000, Arrow Enterprise had become a highly profitable business. And the prosperity was fully reflected by the lifestyle adopted by Jeffrey Archer, MP. He bought a new flat, furnished it without thought to cost, patronised modern art, entertained friends to champagne dinners, and worked harder than ever. In the early 1970s, Jeffrey Archer was being talked off as the whiz-kid of the Tory Party, unstoppable in his climb to its topmost position. He began to dabble in the share market and even the much more volatile and potentially profitable commodities such as sugar, cocoa and copper, gaining expertise as he went along and somehow making just enough profits to go on taking risks in such dealings. His name began to be mentioned as someone who was looking for good investment tips — someone who could lay his hands on large dollops of cash — a rich man out to make a big killing. A tip came, a leaked report of a bank itself investing in the shares of a company in Canada, which was going to put on the market a miracle gadget that would make motor-car engines save gas. Aquablast, Archer fell for it. He bought Aquablast shares in vast quantities. He not only spent his entire savings on the buying spree, but borrowed heavily from friends to be able to mop up whatever shares were available in markets outside Britain. In December 1972, Jeffrey had bought Aquablast shares worth £ 370,000/ half of them with borrowed money. In January, the price of Aquablast shares began to drop. By the end of the year, they were all but worthless. And Jeffrey Archer was a broken man. There was danger of his being declared bankrupt and his creditors were clamouring to recover their money. Worse still, the Canadian police were investigating Aquablast’s business dealings and if only because Archer had, by his wild purchasing spree, helped to boost their shares he, too had come within the scope of that investigation. He had to resign his seat in Parliament and somehow pacify his creditors. Any other man would have buckled down under such a calamity. But not Jeffrey Archer, who seemed determined to spring back into public life as though nothing particularly dreadful had happened. All he had to do was to somehow convince his debtors — if only they would give him a little time. But how can you do it they wanted to know. You’re a ruined man. "I’ll make money by writing books," Archer assured them. "Write best sellers!" They may have laughed — as who wouldn’t? Because only perhaps a dozen writers in the world make the sort of money that Jeffrey Archer owed to them, and they went right ahead with their bankruptcy proceedings. Archer, for his part, divided his time in stalling the process and writing his book. A couple of lean years followed. Archer had to sell some of his valuable paintings and even his house, and yet he somehow contrived to keep up appearances. His plight is reflected by an incident which may or not have actually happened. The police in Canada had finally brought charges of fraudulent business practices against the management of Aquablast, and Archer had to make a trip to Toronto to give evidence. While there, he, too seems to have been kept under watch, and caught while attempting to steal three suits from Simpson’s Stores. On the face of it, the charge seems absurd — for they must have formed a very large bundle indeed — impossible to hide. Anyhow, the shoplifting charge was never pressed. But soon after this, Jeffrey had become a published novelist — and against all odds, right from its start, that book, Not a Penny More, Not a Penny Less, was showing signs of being a real money-spinner. Just as he had predicted, Jeffrey Archer made a fantastic comeback. He paid off his debts by making money as a novelist. Not a Penny More; Not a Penny Less, was followed by Kane and Abel, Shall We Tell the President?, Prodigal Daughter and Beyond Reasonable Doubt, and there were two volumes of short stories, and even children’s books. All the books became bestsellers and each new book seemed to boost the sales of the earlier ones. He became a star money-spinning author, by his own admission he was paying the tax man at the rate of a thousand pounds a day, meaning that his income had soared to £ six million a year. His work for public charities continued, and even the Red Cross came to him for help. For them, he raised an incredible 57 million pounds: for distributing to the starving people of Kurdistan — which is not even a country yet so much as an undefined area shared by at least three countries. He also clawed his way back into the Tory hierarchy. He and his wife were regular guests at Margaret Thatcher’s Boxing Day parties and then, after John Major had become Prime Minister, at his New year’s Day dinners. He was appointed the Deputy Chairman of the Tory Party, and thus became a member of the party’s inner caucus. What with his zest for self-promotion, he was rarely out of the public eye. Almost like a popular film star, he became the focus of attention wherever he went, and even his car, an elegant Jaguar had become easily identifiable. It was that car which had drawn up before the Albion Hotel in Victoria and its driver had flashed his headlights on and off as a signal to the call girl Monica Coghlan as she was about to drive off in another man’s car. Monica had gone to talk to the driver of the Jaguar and had led him back into the hotel. London’s tabloids had caught the scent and were hot on Monica’s trail. Finally the News of the world got hold of her and by whisking her off from place to place, made sure that its rivals couldn’t get at her. Then the paper got her to phone Archer and taped the talk. Archer advised her to go off on a holiday at his expense and arranged that he would send a friend with the necessary cash, The paper made a film of the package being handed over to Monica, and then moved in for the kill: Tory Boss Archer Pays Vice Girl, screamed its headline. In a desperate bid to save himself from ruin, Archer got a friend to provide him with an alibi for the time he had spent with the prostitute, but ultimately that alibi collapsed. So what Jeffrey Archer was punished for was not adultery, but perjury. The judge sent him to jail for four years. If they leave him free to write his novels in jail!